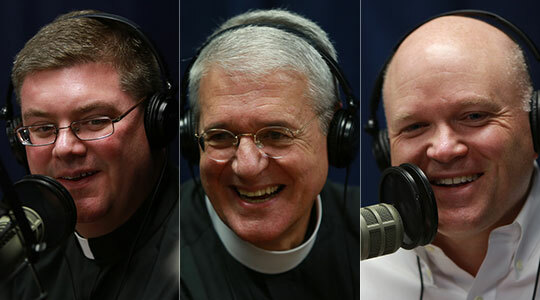 Summary of today’s show: When most men would have been looking at retirement after 30 years as a priest, Fr. Raymond Van De Moortell was transferring from the Jesuits to become a priest of the Archdiocese of Boston. Scot Landry and Fr. Chris O’Connor talk with Fr. Van De Moortell about growing up surrounded by Jesuit missionaries and becoming a Jesuit; his team ministry at St. Adelaide Parish in Peabody; his work at St. John Seminary as a teacher, the academic dean, and the librarian; and why he thinks Latin is here to stay in the Catholic Church. 1st segment: Scot Landry welcomed all the show and he discussed with Fr. Chris the recent turn of the weather. They also discussed the celebration of the feast days for St. Therese of Lisieux and of guardian angels. Fr. Chris also gave a shout out to Catholic students at Boston University he was with over the weekend. Fr. Chris also noted that the inmates at Norfolk State Prison have a new chaplain and he visited them for Mass recently. Today’s guest is Fr. Raymond Van De Moortell, who is academic dean at St. John’s Seminary as well as a parish priest at St. Adelaide in Peabody. 2nd segment: Scot and Fr. Chris welcome Fr. Raymond to the show. Fr. Raymond said he was incardinated as a priest of the Archdiocese of Boston on May 8, 2007. He was previously a Jesuit in California. He grew up in a Jesuit parish and went to Jesuit schools. He was surrounded by remarkable Jesuit men his whole life. Many of them were Europeans—mainly Italian—who had previously served in China and were expelled by the Communists. They were role models of justice, peace, and evangelical love for the Gospel and Jesus. At Holy Family Parish in San Jose, they served many Italian immigrants as well as many Spanish farm workers. As he was growing up, San Jose was only on the verge of becoming Silicon Valley. When he graduated high school in 1965, it was still a sleepy farm town known as the canned fruit capital of the world. Scot said people in Boston often think of Jesuits as academics, but many Jesuits serve in the missions in the most difficult circumstances. Fr. Raymond said they were remarkable men, bright, intelligent, multilingual with bright academic training. Fr. Raymond joined Jesuits to become a missionary and he kept asking to be assigned to the missions. Instead he went on to do doctoral work in sociology of knowledge as assigned by the provincial as opposed to Scripture and theology that he wanted to study. He said sociology of knowledge is looking at the techniques and ways that knowledge is acquired in the humanities in society. He later went back to school as a librarian and study of book curatorship. Fr. Chris asked Fr. Raymond about St. Ignatius. He said the saint was a man thoroughly in love with Jesus. Early in in life he was very worldly and seeking glory and prestige. At a military battle, he was wounded, potentially mortally. In his recovery he began to read devotional reading and was converted to do great things for the Lord like he’d read about. He went back to school to learn languages, including Latin, and was awarded a degree in theology at the University of Paris where he gathered a group of companions, who eventually bound themselves with vows of poverty, chastity and obedience and were the beginning of the Society of Jesus. Their emphasis was on working for the greater glory of God. Fr. Raymond said Ignatius was a mystic who had tremendous energy for education and pastoral work, but also had tremendous union with God in his understanding of the Father, Son and the holy Spirit. Scot noted that Fr. Raymond served three decades as a Jesuit and was then attracted to become a diocesan priest, especially in Boston. Fr. Raymond said he was attracted to people and their spiritual needs. It was an attraction to direct pastoral and sacramental ministry, to the liturgy, the proclamation of the word of God, to catechesis. He was first assigned to the diocese as a priest-candidate for incardination at St. John the Evangelist in Winthrop for four years. He said the people there were responsive, kind, accepting, and supportive. He returned to California briefly to care for his dying father. upon his return eight months later, Cardinal Seán incardinated him and a half hour later he was assigned as pastor of St. Adelaide’s in Peabody. He said it’s a very strong traditional parish. He was a pastor for a year and then was asked to go to the seminary to help in the training of seminarians. He was then assigned Fr. David Lewis, a relatively new priest, and they became a team ministry. He said Fr. David basically runs the parish. Fr. Chris asked him to expand on team ministry. Fr. Raymond said canon law provides for two or more priests in solidarity to take the pastoral responsibility of the parish together. They share responsibility and leadership in every respect. The whole gamut of priestly work is shared in common and that responsibility is located between the two of them. He said it’s been an enriching experience with them both on the same page theologically, liturgically and personally. They provide a solid kind of leadership for a parish that wants to grow in Christ. Scot said there’s probably ten parishes with a team ministry. He said it’s more common to have a pastor and a parochial vicar. How is team ministry different? Fr. Raymond said it’s the sharing of the pastoral responsibility to oversee the spiritual life and evangelization of the people of God. they have the same responsibility in everything. Scot said his experience is that the priests in team ministry are often friends beforehand and they’re the ones who petition the Cardinal to become a team. Fr. Raymond said this is the case and his experience with Fr. David is that he is a remarkable catechist and very good with people. He’s also a financial wizard with the dollars and cents. Fr. Chris noted that if one priest leaves, the team dissolves. A new team could be formed or a new pastor could be assigned. Fr. Raymond talked about St. Adelaide’s as a great community of people who formed in the suburban area in the 1940s when it was mainly apple farms. They moved from Revere and East Boston to build this community. The parish was built in 1962 and the foundation stone was laid on October 11, 1962, the day Vatican II started. He said Cardinal Seán will be coming to celebrate the close of their anniversary year at the end of the month. He said the parish has attracted a number of people who feel affinity for the Extraordinary Form of the Liturgy. Each Sunday they have the Extraordinary Form in Latin at 1pm and that group has grown over the years. It’s a parish of people who love the Lord and it’s a growing parish. Scot asked how many places that the Extraordinary Form is celebrated. Fr. Raymond said there are quite a few places, including St. Paul in Cambridge. He will be celebrating the Mass there on All Saints at 6pm. Also Mary immaculate of Lourdes in Newton and Holy Cross Cathedral have the Mass each week. Scot said his brother Fr. Roger Landry celebrates the Extraordinary Form for people who live on the South Coast and has elements he likes about each of the forms. Fr. Raymond said the New Mass is a beautiful and accessible expression of the faith. The emphasis on the sacrifice of the Mass is there with a rich exposure to sacred Scripture and prayer shared in common. In the Extraordinary Form, the vertical and transcendent aspects are upfront. Of course, it’s in Latin and very formulaic, structured and ritualized. It is profound, deep, and mysterious and points directly to the Divine. Scot said Pope Benedict XVI has written that both Forms of the liturgy can be informed by the other. Fr. Raymond said his celebration of the Ordinary Form has been enriched by the celebration of the Extraordinary Form. He said the reverence in the way one prays the prayers is emphatically made much more real and person to him in a deep and profound way as it is centered extraordinarily on God himself. 3rd segment: Scot asked Fr. Raymond about his work at St. John Seminary. He said he teaches two classes in Philosophy for the pre-theologate (first and second year). He teaches courses in Ancient Philosophy as well as other philosophy courses for the theology students (third and fourth year). Fr. Chris said Fr. Raymond gets excited by old books the same way he gets excited about a buffet table of desserts. Fr. Raymond is also the librarian and they have very old books. Fr. Raymond said they have books owned by the first bishop, Bishop Cheverus, as well as every bishop since then. They have many books in French because it was the French who brought Catholicism to Massachusetts. The seminary has had in its library holdings about 65,000 books from the very oldest manuscripts. He said they have two volumes of the works of St. Thomas Aquinas from 1542 and were printed in Lyons, France. Scot asked him for his favorite philosopher, noting that philosophy is a very big field. He said philosophy is the study of the big questions about life and the universe. Fr. Raymond said he is very drawn to Plato and the Platonic dialogues are a constant fascination. But Augustine is another high point in the history of knowledge. You can never become bored with Augustine. He is amazing on almost every level. In the modern world, he’s drawn to Habermas, who was a Marxist, but was still drawn to the big questions. Habermas wrote a book with Pope Benedict and they came to a common understanding about secularization. Fr. Raymond said there’s a great picture of Habermas and Pope Benedict speaking together on these great philosophical ideas. Scot asked how to bring philosophy down to earth for the average person in the pew. Fr. Raymond said philosophy is indeed not easy, but is important for exploring the important questions of life. He said the seminarians are in general wonderers and big thinkers and enter into conversation with these large thinkers with passion and make the connections in grappling not only with the historical content but also the insights and values of the individual thinkers they study. Scot noted that Fr. Raymond also teaches Latin in the seminary. He said has a class of second-year students who are studying Latin composition and he said it is a merciless class. It demands precision, but they do it with generosity and a great deal of fun because they are excited about it. They know that these are the building blocks of language and understanding. Scot asked why he teaches Latin. Fr. Raymond said to be liturgically sensitive to the Latin traditions of the Church, to be able to better read the Church documents which are written in Latin, to be able to read the great works of Catholic authors which were often written in Latin. Scot asked if he thought Latin will be the official language of the Church in the future. Fr. Raymond thinks Latin will persist and will always be there. The roots of modern Indo-European language is in Latin. Fr. Chris added that he thinks that tradition is part of the backbone of the Church and Latin is a serious part of our tradition. Scot noted that an African priest he knows said that when they train catechists they wait until there is an English translation instead of translating directly from Latin.